"Sweet Trouble" is just that - four sweet adventures for the Card Captor Sakura fan. 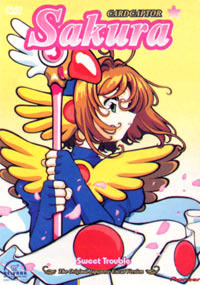 The adventures of Sakura Kinomoto continue in "Sweet Trouble," disc nine of Pioneer's release of the uncut Japanese version of Card Captor Sakura. Sakura Kinomoto is your average ten-year old girl - that is, until she opens a mysterious book in her father's basement, releasing the Clow Cards, magical cards made by the Chinese magician Clow Reed. Now, the cards are causing trouble in the real world and Sakura has to catch them - luckily she has a little help, from the Clow Book's guardian, Kero, and her friend Tomoyo. Help comes from another, unexpected source - Li Sharon, the Chinese transfer student who is also the great-grandson of Clow Reed. Together, the group has to recollect the mischievous cards. Combining the magical girl aspects of Sailor Moon and the "catch'em all" successes of Pocket Monsters, CLAMP, (a group of all-female manga artists) found success with the Card Captor Sakura series. The lighthearted romp is (for the first season anyway), uncharacteristic of CLAMP or the animating studio Mad House (known for "Wicked City"). The series garnered attention Stateside because of its cute character designs and realistic (other than the part about catching magical cards) look at Japanese elementary school life. It became so popular, in fact, that Nelvana decided to pick up the series for American broadcast. After an editing job unrivaled (in both sheer amount of editing and stupidity) by any recent series, except maybe Robotech and Dragon Ball Z, the retooled Cardcaptors debuted on the Kids WB. The show was so edited that clips from even more mangled episodes had to be shown before and after the main episode to pad the series out to broadcast length. Pioneer handled the Japanese language release of Card Captor Sakura, and for the most part, they've done a good job. As such, "Sweet Trouble" is cut from the same mold as the previous eight discs of Japanese Card Captor Sakura, sharing the same weakness and strengths. "Sweet Trouble" contains four episodes, twenty-nine through thirty-two of Card Captor Sakura. "Sakura's Sweet Cooking" - features Sakura and Tomoyo and their entire class in Home Economics, attempting to bake cakes. However, every time they do it, they cakes come out far too sweet (is that even possible?). As with the previous mischief in the area, a Clow Card is behind it, and Sakura and Li struggle to capture the Sweet card. "Sakura and the Injured Card" - Sakura attempts to catch the Dash card. The card injures itself, but escapes into the home of one of Sakura's schoolmates, Rei. Rei, a track athlete, nurses the card back to health and the card makes her run faster than she had ever been able to before. This is probably the slowest episode on the disc. "Sakura and the Nameless Book" - Sakura faces gigantic cats and a dragon as another school friend causes trouble with the Create card. Sakura has to use her wits (and her other cards) to capture Create. "Sakura, Kero, and Sharon" - Probably the best episode on the disc. In a Card Captor twist on a classic idea, when capturing the Change card, Kero and Li change bodies. The pair has to wait a day before they can change back, so Kero spends a day attempting to act like Li, while Li gets into trouble as Kero. Like the last discs, "Sweet Trouble" is short on extras - it only has sketches. However, with long running series like Card Captor Sakura, extras tend to be few and far between. The visuals are bright and do justice to the world of little Sakura. However, there seems to be a slight audio hiccup - off-screen or far away voices don't register (though they are subtitled). After trying every audio setup I could neither correct the problem or replicate it on other discs - it's an issue that's bothered me only on Card Captor Sakura discs. It's a small gripe, but a perplexing one. The disc, of course, lacks an English track because there is no uncut dub track of Card Captor Sakura. I am sure there is someone out there who would want a dual-language DVD, but the market for something of nature is so small that I don't think it matters. "Sweet Trouble" winds down the adventures of Sakura in season one. From disc ten forward, things get more difficult (and decidedly more CLAMP-like) for Sakura. For this collection of episodes, it is a good disc for CSS fans to have.